Bauen & Wunnen magazine interviewed founder of Sideshore Architecture + Urbanism, Carolina Lazo, in their October 2018 issue. 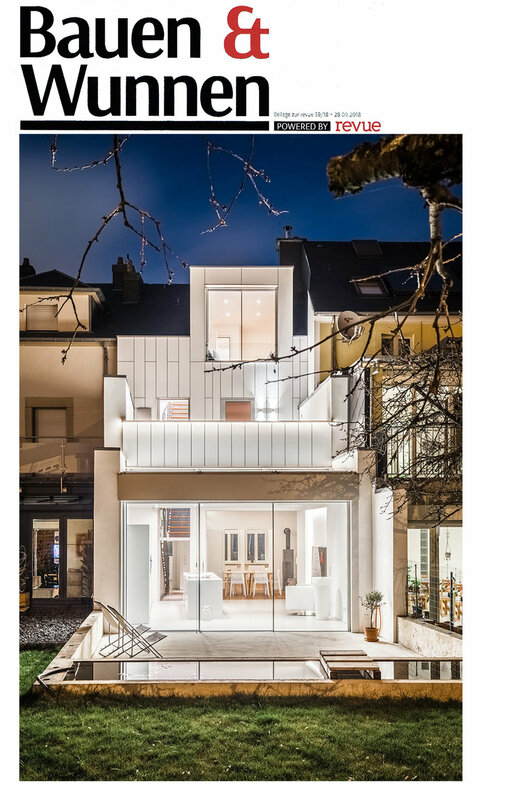 In the article, titled “Neu Gedacht” (Freshly Conceptualised), Carolina discusses the renovation of old houses in Luxembourg and how Sideshore works to freshly reconceptulise these buildings. Throughout the article, the challenges of designing and creating new living spaces that work together with the existing elements of a building are discussed: how to create a contrast between new and old inspiration, whilst taking into consideration the urban and historical aspects of the existing construction. The article features a project that Sideshore undertook in Luxembourg which is refered to as the “House with 2 Facades” as the front of the house remains in the original style with the original design details, where as the back has been completely remodelled and modernised. Carolina also discusses the pros and cons of undertaking renovation projects versus buying a new property, and how to balance the design ideas of the client with that of the architect. On Wednesday 7th February 2018 Carolina will be taking part in a panel discussion at the third BLC Professional and Entrepreneurial Women event, sharing her stories and advice on launching a company here in Luxembourg. She will also be giving advice to women looking to set up their own business, discussing the challenges faced in doing so in Luxembourg. Carolina has been based in Luxembourg since 2000 and is well versed in the challenges of the day to day running of an architecture business here. She will be joined on the panel by Joanna Denton, an entrepreneur and Chair of the British Chamber of Commerce in Luxembourg, and Tina Radford, Gweek Ambassador at Speech Intelligence Analytics. The event will take place at the Residence of the British Embassy, 16 Boulevard Franklin Delano Roosevelt, 2450 Luxembourg. The event is also open to non-members. We hope to see you there 18.30 – 21.00. Welcome to our new look. We hope you enjoy browsing through our new website! This year will be filled with more exciting projects so keep in touch and contact us if you have any questions.